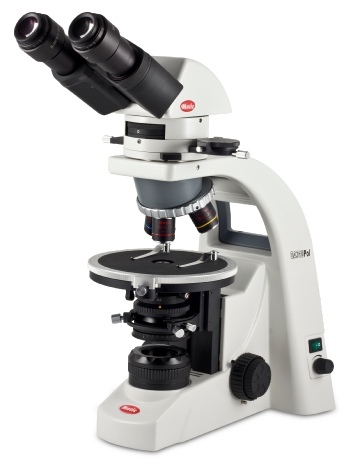 Our Motic BA310POL polarising microscope is the perfect laboratory based Counting and ID work with Soil Samples with well laid ‘all at hand’ controls, 30 binocular head and widefield eyepieces provide comfort for prolonged work sessions and is easy to set up and use. In addition to the standard Motic BA310POL bulk ID microscope we add 15x eyepieces with Walton and Beckett graticule fitted, phase contrast optics 10x and 40x and a NA0.90 condenser with phase slider for counting. The 10x phase optic is also used for Dispersion Staining. A 10x POL optic and a Lambda red tint plate are used for cross polarisation in fibre Identification use. Optics are individually centred on the nosepiece allowing for greater accuracy in specimen centration for polarisation use. An attachable mechanical stage is also included to allow controlled movement of specimen for counting purposes. 10x POL, 10x Ph and 40x Ph optics supplied.